A potato chip (American English) or crisp (British English) is a thin slice of potato that has been deep fried, baked, kettle-cooked, or popped until crunchy. 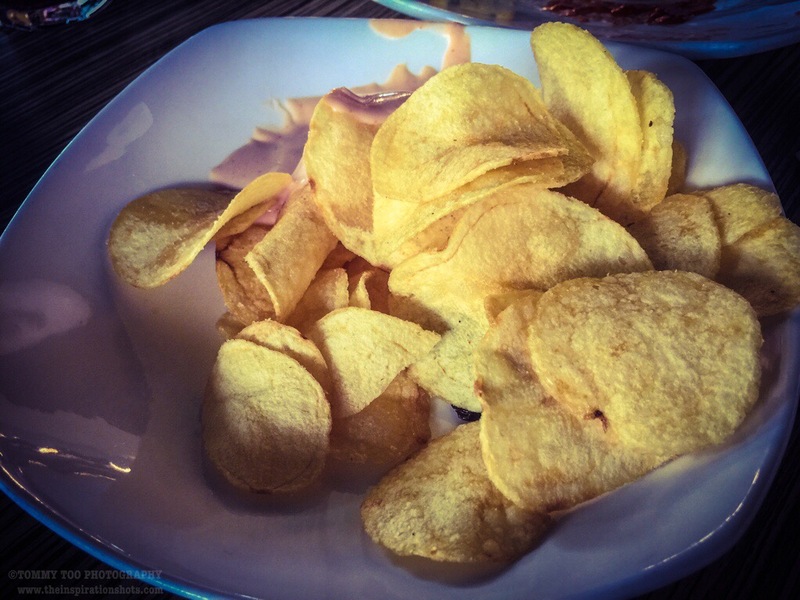 Potato chips are commonly served as a snack, side dish, or appetizer. The basic chips are cooked and salted; additional varieties are manufactured using various flavorings and ingredients including herbs, spices, cheeses, and artificial additives. “Crisps”, however, may also refer to many different types of savory snack products sold in the United Kingdom and Ireland, some made from potato, but some made from corn, tapioca, or other cereals, and root vegetables, just as other varieties of chips are consumed in the United States.Potato chips are a predominant part of the snack food market in Western countries. The global potato chip market generated total revenues of US$16.49 billion in 2005. This accounted for 35.5% of the total savory snacks market in that year ($46.1 billion). The earliest known recipe for potato chips is in William Kitchiner’s cookbook The Cook’s Oracle, first published in 1817, which was a bestseller in England and the United States. The 1822 edition’s version of recipe 104 is called “Potatoes fried in Slices or Shavings” and reads “peel large potatoes, slice them about a quarter of an inch thick, or cut them in shavings round and round, as you would peel a lemon; dry them well in a clean cloth, and fry them in lard or dripping”. Early recipes for potato chips in the United States are found in Mary Randolph’s Virginia House-Wife (1824), and in N.K.M. Lee’s Cook’s Own Book (1832), both of which explicitly cite Kitchiner. Nonetheless, a legend associates the creation of potato chips with Saratoga Springs, New York, decades later. By the late 19th century, a popular version of the story attributed the dish to George Crum, a half African, half Native American cook at Moon’s Lake House, who was trying to appease an unhappy customer on August 24, 1853. The customer kept sending his French-fried potatoes back, complaining that they were too thick. Frustrated, he sliced the potatoes razor thin, fried them until crisp and seasoned them with extra salt. To Crum’s surprise, the customer loved them. They soon became called “Saratoga Chips”, a name that persisted into at least the mid-20th century. A version of this story popularized in a 1973 national advertising campaign by St. Regis Paper Company, which manufactured packaging for chips, said that Crum’s customer was Cornelius Vanderbilt. Crum was renowned as a chef and by 1860 owned his own lakeside restaurant, Crum’s House. In the 20th century, potato chips spread beyond chef-cooked restaurant fare and began to be mass-produced for home consumption. The Dayton, Ohio-based Mike-sell’s Potato Chip Company, founded in 1910, identifies as the “oldest potato chip company in the United States”. New England-based Tri-Sum Potato Chips, originally founded in 1908 as the Leominster Potato Chip Company, in Leominster, Massachusetts claim to be America’s first potato chip manufacturer. Chips sold in markets were usually sold in tins or scooped out of storefront glass bins and delivered by horse and wagon. The early potato chip bag was wax paper with the ends ironed or stapled together. At first, potato chips were packaged in barrels or tins, which left chips at the bottom stale and crumbled. Laura Scudder, an entrepreneur in Monterey Park, California, started having her workers take home sheets of wax paper to iron into the form of bags, which were filled with chips at her factory the next day. This pioneering method reduced crumbling and kept the chips fresh and crisp longer. This innovation, along with the invention of cellophane, allowed potato chips to become a mass-market product. Today, chips are packaged in plastic bags, with nitrogen gas blown in prior to sealing to lengthen shelf life, and provide protection against crushing. Traditional chips were made by the “batch-style” process, where all chips are fried all at once at a low temperature and continuously raked to prevent them from sticking together. Industrial advance resulted in a shift to production by a “continuous-style” process, running chips through a vat of hot oil and drying them in a conveyor process. Consumer desire for original style chips resulted in the introduction of traditionally made “kettle-style” chips in the 2000s (known as hand-cooked in the UK/Europe). In an idea originated by the Smiths Potato Crisps Company Ltd, formed in 1920, Frank Smith packaged a twist of salt with his chips in greaseproof paper bags, which were sold around London. The potato chip remained otherwise unseasoned until an innovation by Joe “Spud” Murphy, the owner of an Irish chip company called Tayto, who in the 1950s developed a technology to add seasoning during manufacture. After some trial and error, Murphy and his employee, Seamus Burke, produced the world’s first seasoned chips: Cheese & Onion, Barbecue, and Salt & Vinegar. This innovation was notable in the food industry. Companies worldwide sought to buy the rights to Tayto’s technique. The first flavored chips in the United States, barbecue flavor, were being manufactured and sold by 1954. In 1958, Herr’s was the first company to introduce barbecue-flavored potato chips in Pennsylvania. Posted on August 27, 2016, in iPhoneOgraphy 366, Photography and tagged #iphone6plus, #iphoneography366, #photography, photooftheday, potatochips. Bookmark the permalink. Leave a comment.